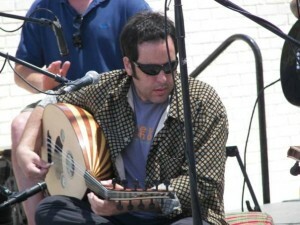 Alexander Khalil is an ethnomusicologist, a performer, and composer. He holds a Master of Fine Arts degree in music composition from California Institute of the Arts, and a doctoral degree in music from University of California, San Diego. His doctoral dissertation, “Echoes of Constantinople: Oral and Written Tradition of the Psaltes of the Ecumenical Patriarchate of Constantinople,” explores the aural aspects of the chant tradition of the small group of chanters who remain at the church of the Ecumenical Patriarchate of Constantinople in Istanbul, Turkey. Aside from this work, Dr. Khalil has spent significant time studying language, and he has been deeply involved in the study of traditional musical performance practices in China, Japan, and Indonesia. Currently, he is conducting research on the role of childhood music education in the development of temporal perception at the Temporal Dynamics of Learning Center, in the Cognitive Science Department at UCSD. He has spent a significant amount of time studying language and performance practices in many countries including China, Japan, and Indonesia. Dr. Khalil is also psaltis at St. Spyridon Greek Orthodox Church in San Diego, CA. He has contributed as a cantor to recent efforts of both Cappella Romana and the Mount Lebanon Choir, and has taught at workshops for the Koukouzelis Institute.